When I discovered the Books of Secrets, I was smitten not only by their wealth of useful knowledge but by their charm. Their primordial scrambling of appetites and arts mirrored the synesthetic nature of the senses. 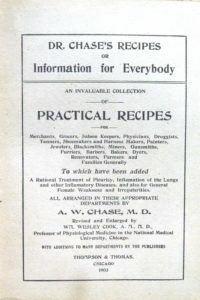 Here home remedies mingled with folk wisdom, traditional knowledge with family lore. They combined the seemingly contradictory strands of the practical and the mystical in a way that reminded me of perfume, which—for all the formulas generated in all the labs in all the fragrance houses—can never be reduced to a science. 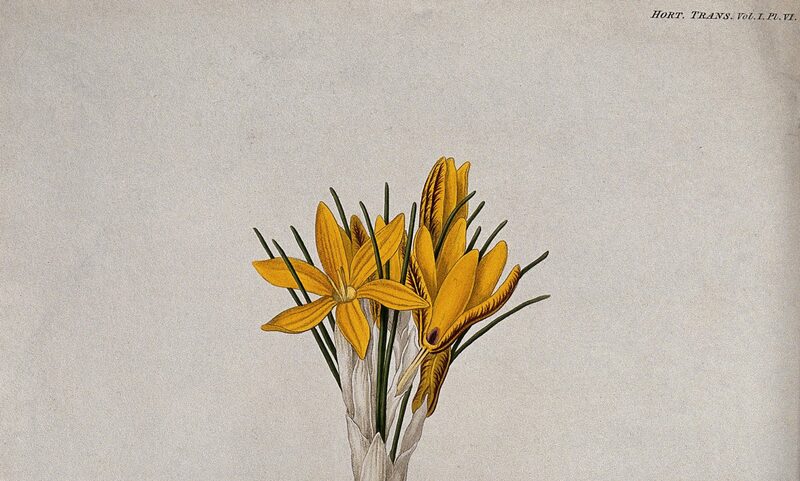 Indeed, herbs, flowers, and spices played a great role in the arts they covered, and so the books focused on the same ingredients that are used to create natural perfumes. I’d reveled in the same promiscuous muddling of material in my library of antique perfume books, in which fragrance recipes rubbed shoulders with alchemy, folk remedies, and precursor versions of aromatherapy. But when I tried to use the recipes in a straightforward way—as if from a cookbook, I discovered something interesting. 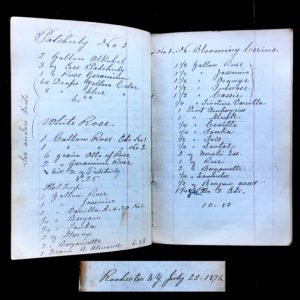 I’d always thought, in the back of my mind, that if I ran out of ideas for new perfumes, I could use the recipes in these books to replicate the perfumes that used to be made—though I had not quite figured out how I would find, or afford, the copious amounts of musk and ambergris so many of the recipes called for. One day I decided to put that idea to the test and start making the perfumes in some of my old recipe books. 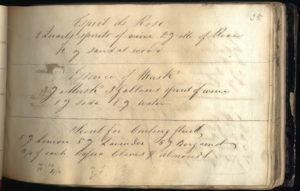 Many of the formulas were for what were known as soliflors, the attempt to replicate the aroma of a delicate flower that couldn’t be scent-harvested, like lily of the valley or violet; they seemed to rely heavily on bitter almond, which smells like cherries, to convey the nuance of flowers. When I made a couple of the perfumes, however, they struck me as decidedly “old lady” and uninteresting. 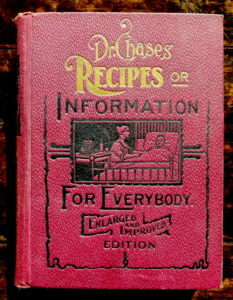 Moreover, as I combed through the books, giving the recipes a closer look, I realized that the recipes had frequently been copied from one book to another. Over time, presumably by being carelessly recopied by scribes who didn’t understand the processes behind the words they were transcribing, many of the recipes had become garbled in places, or completely unintelligible. None of this stopped me from regarding these antique books as important links to a remote and rich past, initiating me into the mysteries of antiquity. In fact, I realized that their true genius lay not in their formulas but in the world they conveyed, a lost world of eccentric personalities consumed with the passion for travel to uncharted places, in search of undiscovered treasures and exotic substances. And the most important “secret” they contained was an alternate way of looking at the world—an aura of romance, sensuality, adventure and creativity. Inherent in the Books of Secrets were attitudes and beliefs that grew out of the medieval imagination and resonated deeply with my work as an artisan perfumer. They reflected a belief in “Maker’s knowledge” (verum factum), which means that to know something means knowing how to make it. Such expertise cannot be acquired from someone else’s experience, but must be accrued by handling, experimenting with, and learning from the materials themselves. The search for how to do something was an essential part of the process, and it even had a name: venatio, “the hunt,” which referred to the hunt after the secrets of nature. 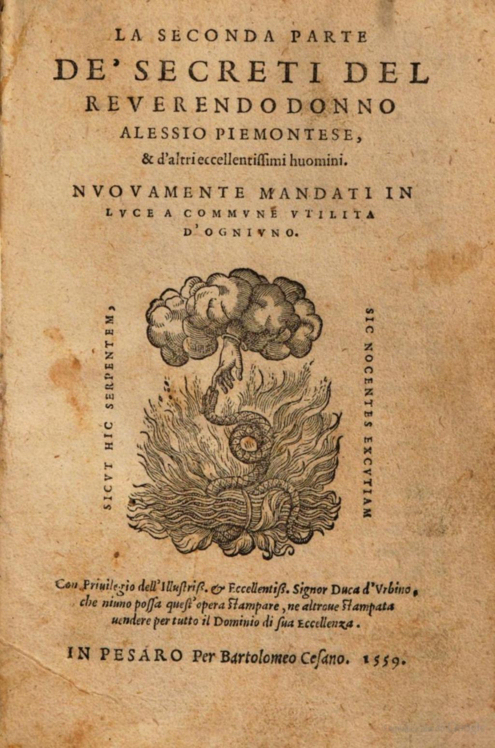 Venatio was exactly what I experienced when I was searching for the lost knowledge of natural perfumery. 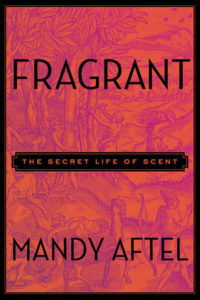 Mandy Aftel is an artisan perfumer who has published on scent and flavour. She also has a small museum, The Aftel Archive of Curious Scents. (Details here.) 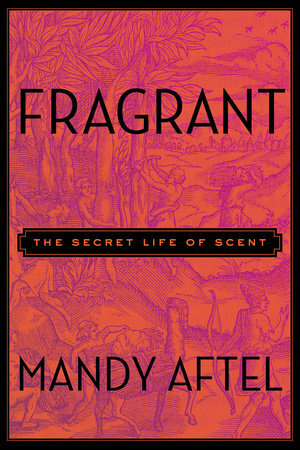 The above excerpt is from her award-winning book, Fragrant:The Secret Life of Scent (Penguin, 2014). You can purchase her books here. 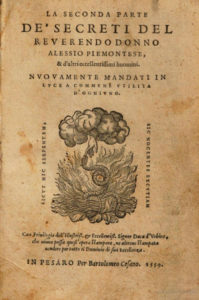 A peddlar, from the Italian Frontispiece of Alessio Piemontese. In early America, settlers on an expanding frontier had to rely on their own skills and know-how. At the same time, itinerant peddlers made this self-reliance possible, by providing both materials that couldn’t be grown or made and practical information and instruction on cooking, medicine, and more. Even in Colonial times, aromatics peddler was a recognized profession, as distinct from, say, indigo peddler. “Usually a free-lance,” writes Richardson Wright in Hawkers and Walkers in Early America, “he managed to scrape together ten or twenty dollars, which was enough capital to set himself up in business, that is, fill his tin trunk with peppermint, bergamot, and wintergreen extracts and bitters.”[i] In that era, every settler was a distiller, and the bitters were in great demand to mix with homemade spirits. 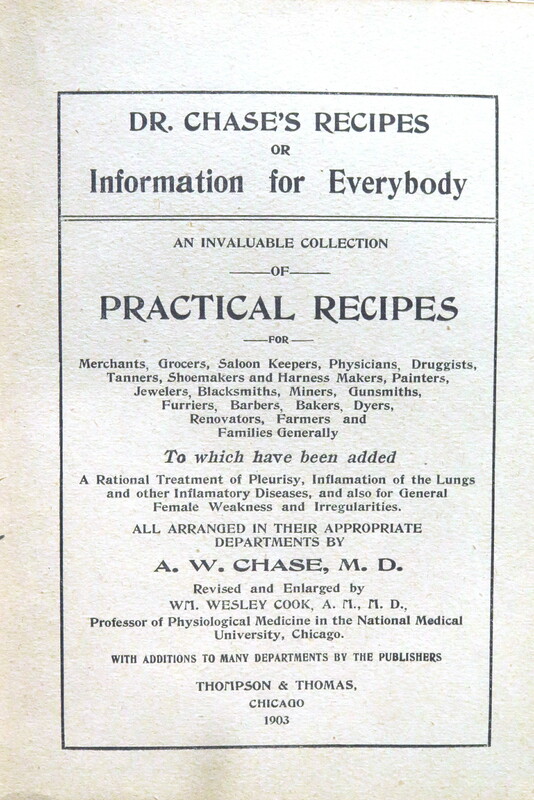 Aromatics were also used in food and all kinds of home remedies. Peddling expanded with the frontier, and the peddler became a familiar figure there, his one or two small oblong tin trunks mounted on his back with a leather strap There were the general peddlers who hawked an assortment of useful “Yankee notions”—buttons, sewing thread, spoons, small hardware items, children’s books, and perfume. Bronson Alcott, Louisa May Alcott’s father, left Yale to become a Yankee notions peddler before developing into a major figure of the transcendentalist movement. [i] Richardson Wright, Hawkers and Walkers in Early America: Strolling Peddlers, Preachers, Lawyers, Doctors, Players, and Others from the Beginning to the Civil War (Philadelphia: J. B. Lippincott, 1927) 56-57. [ii] William Eamon, Science and the Secrets of Nature (Princeton: Princeton University Press, 1996), 359. 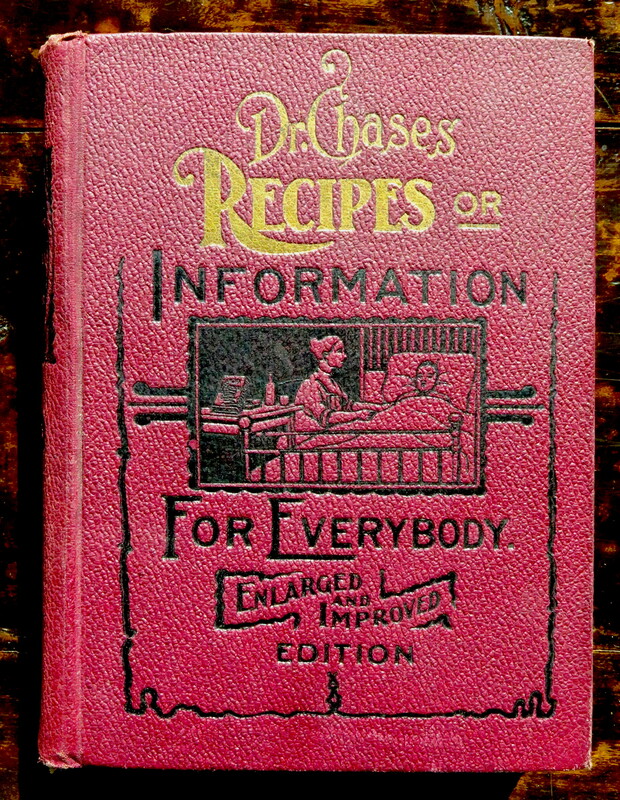 [iv] A. W. Chase, Dr. Chase’s Recipes or Information for Everybody, revised ed. (Chicago: Thompson & Thomas, 1903), 37.